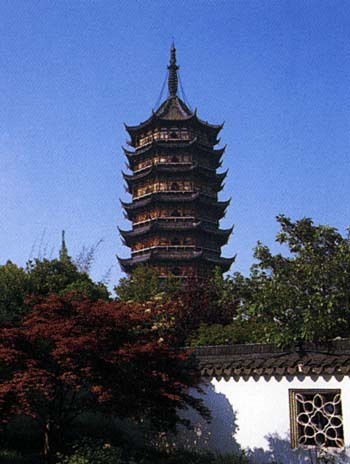 Panmen Gate stands at the southwestern corner of the ancient city of Suzhou. This city gate is the most completely preserved part of the ruins of the ancient city of Suzhou. Stepping onto the top of the gate, you can see the Wumen Gate Bridge and the Auspicious Light Pagoda. Together, they are popularly known as the Three Scenes at Panmen Gate. The present Panmen Gate was rebuilt in the 11th year of the reign of Zhizheng in the end of the Yuan Dynasty (1271-1368) and renovated during the following Ming and Qing dynasties. With water gates and land gates towering side by side, Panmen Gate looks very imposing. The land gate consists of double gates, one inside and the other outside, with city walls forming a square terrace of about 20 meters long on each side. Once the invading enemies were seduced into this place, they would be like turtles locked in a jar.